As I start making the strokes I am reminded of a great man who once said: “Every child is an artist” Picasso. I started to get creative and mix the colors. To add something special to my painting I knew I had to do something different. My hands started swishing the paint from side to side. Splashing the paint was next on my agenda…. Oops I guess my clothes and the surrounding area are now part of my artwork. Oh well…. I’m sure my mom will not mind. After all, I am creating!! Make the paint and then let them stick their hands in it and explore their creativity. Just remember that if your child is not ready to stick their hands into the paint, be sensitive to their needs. Provide them opportunities to paint with instruments such as a paintbrush or sponges. Play dough is one of those awesome activities that has endless amount of benefits. The benefits depend on what and how you play with play dough. This month’s skills aim to support the fine motor skills as well as building body awareness. Simply place some water into a spray bottle and let them have fun. They can spray targets such as spider webs, sticks, toys or simply making wet marks on the grounds or walls. This is a really great activity to strengthen all those small muscles in their hands. Initially they may be using two hands to squeeze the lever. As their strength builds they will only need to use one hand. An additional benefit to this activity is that it helps to separate the hand into two parts, which is important for many skills such as cutting. This is another way to add a variety to your obstacle course or just play on its own. Simply cut a pool noodle in half and place it on the ground. Then get your toddler practicing their balance skills by walking on it. I would encourage walking barefoot as it provides lots of tactile input into their feet. It also provides better grip while walking. If single line is too difficult to walk on, you can join the two pieces next to each other. This will create a wider base. To make it more functional you may include a beanbag toss in there. As they reach the end of the balance beam they can pick up a beanbag off the floor and toss it into a target. The target can include a laundry basket or a cardboard box. At this age we can encourage drawing vertical and horizontal lines and circles. In the past few months I have been sharing a variety of ways to start practicing and reinforcing pre-writing skills. This month I thought we would have some fun with water and paintbrushes. The first part of this activity is simply having a ‘free play’. Meaning let them draw whatever they want. Simply let your toddler dip their paintbrush into the water and then let them draw on the ground. Using outside’s concrete path is ideal as it provides most visual feedback. If using a paintbrush is a new concept to your toddler this part is particularly important. It will give them an opportunity to explore, experiment and manipulate. The second part can include some imitation. Your toddler can try and copy your patterns. You can draw vertical lines by saying ‘Let’s draw some rain’. Then to draw the horizontal lines you can say/sing (to the tune of the wheels on the bus) ‘and now the wipers go swish, swish, swish’. Followed by, ‘now the windows are clear and the wheels on the bus go round and round’. While singing and drawing circles of course. If you were doing this outside I would recommend also doing large lines and circles so it includes using their whole arm when drawing. This is a trick to help the brain remember this information better. Equipment needed: Exercise ball, medium sized container and child specific toys/objects such as toy cars or animals. To set up, have your toys placed on one side of the ball and the empty containers on the opposite side. Then have your toddler lie down with tummy down on top of the exercise ball. Once laying down support their hips and help them move to the front so their hands can reach the floor. While supporting them through the whole game have them reach for the toys and transfer them to the container. Try getting them to cross their midline by encouraging not to switch hands after picking up their toy. 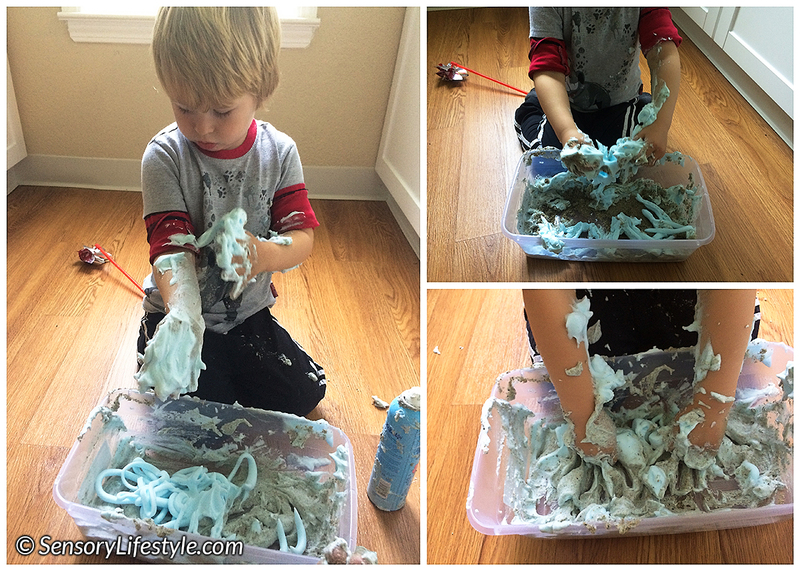 To try another texture let’s combine shaving cream and sand. The quantity is not that important. It is really a child directed activity. – Play kitchen: This is a good way to start as they can themselves use cups, spoons and hands to mix the two ingredients. Then they can make cakes, muffins etc. – Pre-writing: They can use their pointer finger to draw or imitate various scribbles or lines. – Dirt driving: You can bring in some small matchbox cars and pretend to be driving through dirt roads. Of course they will have to go through a car wash and get clean. – Swamp exploration: Maybe you can pretend it is a swamp. You can have various frogs, snakes, and crocodiles moving around the swamp. You can hide the animals and then they have to find them and vice versa. Even tough the name suggests a winter activity this can be done anytime. It’s actually an indoor activity. The skates are shoe box lids. Have your toddler put one foot into one lid. The aim of the game is that they have to slide their feet across the floor and make sure that their foot doesn’t come out of the ‘skate’. This may be a little tricky at first and you may need to help them out with their first few steps. While ‘skating’ they can go on various missions of moving objects from one end of the room to the next. Examples can include different blocks, dolls or toys. a) Find a nice concrete clearing that you can draw on. Usually outside your house or a playground will work great. 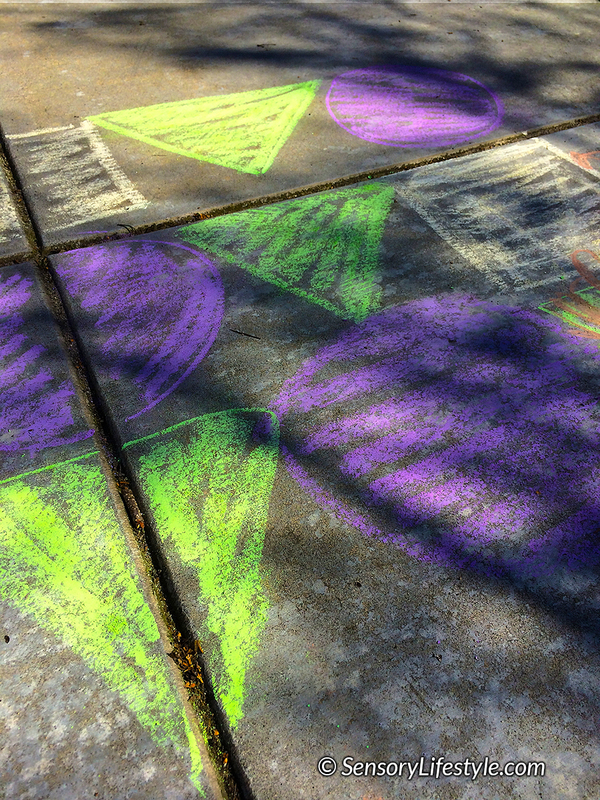 b) Then using chalk draw a variety of circles, squares and triangles. Make sure the shapes are close enough so they can touch. The distance is important, as your toddler will most likely not be able to jump very far yet. You can also use various colors. c) When all the prep has been completed get your toddler jumping from one shape to the next. First, it can be random but later you can provide instructions on colors and shapes to jump on. This will be a great way to start getting familiar with simple shapes and recognizing different colors. 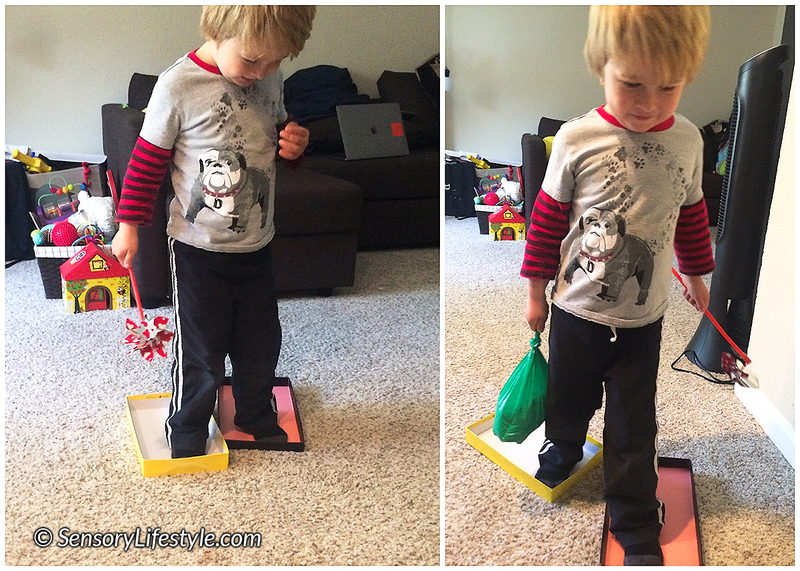 This activity is really aimed at pushing their gross motor skills but also improving their motor planning skills. A playground is one of the best places for just that. This activity is really to help and encourage your toddler to look at the playground differently. If you see your toddler playing on the playground a certain way, see if you can encourage them to explore pieces of a play structure in a different way. For example if playing on a slide maybe instead of going up through the stairs to get to the slide they can go up the slide. Can you imagine the amount of strength your toddler has to use to get to the top? What about if they are playing on the swing – instead of just going back and forth maybe they can figure out how to spin themselves around. By providing them with small cues they can hopefully expand how they play on the playground and not only get stronger but have their confidence increase. There you have it. My top 10 Sensory Activities for your 24 month old toddler. These are bound to spark up other ideas. Let me know what activities you have tried in the comments section below.